About 1860 Grandfather George Wilcox was sent out from St. Neot, England to a small town in South Australia - Gawler, north of Adelaide. He was given £100 to help his brother Joseph from bankruptcy in the store. They apparently prospered and bought up large tracts of land in South Australia on which they ran 1 sheep to 11 acres. They had gone into partnership with the ship’s captain - Mr Hamilton - and so were able to get into anything to do with shipping. At one time they secured a big consignment of bacon and tried to sell it in a part of the far east where no pig was eaten. It had to be brought back. Their second son, George Seaborne was born in 1873 on board the sailing ship "City of Adelaide" when just off the Scilly Isles. He was registered in Hepney, England, where all British babies born on British ships, were registered. The Wilcox's made numerous trips on this ship. On one voyage that ship actually took only 5 weeks to reach England, whereas at times it could take 6 months. The "City of Adelaide" ended up moored at Glasgow, moored on the Clyde as a recreation and camping boat for the British navy. It sank there at its mooring in 1980. Grandfather George Wilcox gradually set up wool stores to sell his wool and hides and skins in the capital cities and many towns. Eventually running 35 centres as alternately George Wilcox & Co., Wilcox Mofflin & Co. When in Sydney he(grandfather George) bought 3 blocks of harbour front land right on the end of Darling Point. These he gave to his sons Sidney, George and Murray. They drew for these and our father, George, drew an end block which was named "Okinya." The name is aboriginal for "a well." There was an old store well fed from a natural stream running under Darling Point on it. The sailing ships used to get their water supplies from this well. The other end block was drawn by Sidney and had on it an old 4 story house built by a Captain Malcolm and first known as "Malcolm's Folly", then "Chollerton" It was eventually bought by Sir George Julius, the inventor of the totalisator. Augustus Gibbes was resident of "Chollerton", 91-93 Yarranabbe Road, Darling Point in 1893. The middle block, drawn by Murray was called "Yatalunga." Okinya, 85 Yarranabbe Rd., Darling Point, was built about 1898. George married Constance (Venie) Navena WelNewman in 1899 of Wagga. We five children were born at Okinya. Sir Jarvie Hood confined Venie for the births of the children. In 1912 Okinya was altered to make more accommodation - a bedroom and bathroom were pulled down and 2 bathrooms and 3 rooms were added. The house was run with a cook and housemaid in the early years, at another time. with a housekeeper and nurse. We went to junior schools till 1912 and travelled along Darling Point by a double-decker house bus. Rita first went to a Froebel Kindergarten in Rushcutters Bay as she would poke at the baby Alan's eyes and run away with him. Alan went to Miss van Heuklaus Boys Preparatory School about 1905 and then to King's School to board (Parramatta). About 1908 Rita and Poppy went to "Shirley" in Edgecliff Road and later to board at Normanhurst, Ashfield. Mother took us to choose our own school. Jean and Jack went to kindergarten with Miss Lion and Miss Horsley on Darling Point. They then went on to Ascham and King's School, respectively. At this stage Mother (Venie) ran the house with a housekeeper and laundress. When Dad came home from office he always had a Dewar's Whiskey and hors d’oeuvre with us hanging on for a few nibbles. In those days it was caviar, pâté de foie gras, olives etc. Every week he brought home his salary. In a brown envelope containing seven gold sovereigns (£1 each, now $14) for the housekeeping. We were very lucky children as we had a big play room where we could each have our own hobbies. There were 2 swimming pools - one with. a shallow beach, the other a deep pool jutting into the harbour. Our father George had a bachelor friend - an English engineer, John Bainton. He was wonderful to all of us, always coming at Christmas with exotic presents. He had a car and a motor boat - the latter kept near us in the next door boat house. Mother and Dad and many friends and we Children had outings in this. On one occasion their Scotch terrier went overboard into the harbour and Jack had pushed him in! Dad and his friends used to put out a bait for sharks which we often saw in the harbour, but I don't remember one being caught. 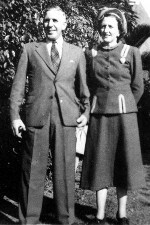 Jack and Betty bought land in Gordon and built a house there. After Mother's death in 1932 Okinya was let till we decided what to do. We thought of demolishing it and building a four storey building of flats which was designed to cost £10,000. Jack would not agree to this so he bought us out. Jack bought the four of us out for £1000 each. That was in about 1936. He and Betty and the family lived there till 1956 with the six children Venie, Sid & Jim. George and the twins Gai And Mymie were born there. The Okinya house was burnt down completely in 1951 when a spark from garden rubbish being burnt off caught fire under the roof and spread exploding in the ceilings which collapsed and caught fire in all the rooms. Fire engines had trouble along Yarranabbe Rd and then hoses were not strong enough to break the windows. The family was accommodated in a flat nearby till Jack converted the stables to a liveable state. He then proceeded to repair the house. Jack altered and renovated it till 1954 when he gradually developed stomach cancer. The building was close to lock up stage when he died in hospital from inoperable stomach cancer and after his death it was sold to a builder and a huge block of flats was erected taking up the whole site. The flats are called SANTINA. On one occasion the housemaid was asked to hang the canvas cover round the bird cage. She stood on the lid of a liquid manure cask and fell in up to her waist - great fun for us. John Badminton was called "Pip" by us as he always pipped his car horn when he came to see us. He was instrumental in bringing from America the first telephones, first shop lifts, and first moving stairways. Grandpa George in Adelaide sent us a French car - a de Ion Boston - by ship. It was drawn by a horse from the ship through Sydney into our carriage shed above Okinya. Dad and all his friends toyed with it for months to get it going. It never went so was carted away by a horse! At One time we children adopted a stray Irish Terrier. He and the bull-dog next door hated each other and always fought. One day the bull-dog got him in the pool and our housekeeper had to take the clothes prop and a pepper pot to separate them. That makes me think of the man with a cart load of clothes props for clothes lines who used to call out every few weeks as he drove the horse by. In those days we had only open gas flames in the house for lighting; then came "mantels" of fine material which burnt with a better light, but broke easily if wobbled or touched with a match - 1910. The street lights had this system and old lamp-lighters used to go round all the suburbs lighting these each night with a candle on the end of a long stick. Electricity came later, about 1918. Electric trams ran along New South Head Road from King St. to Watson's Bay. There was a horse drawn tram at La Perouse. These were stopped about 1965? and replaced by buses. A Mr Allen was the only man in Sydney who had an electric motor car about 1910-1912. It had a box-like body and was the same back and front. Dad bought a single seater Renault car about 1908-1912, its number was 26Y, only on the back. It had a rubber-bulb for a horn and hand-worked screen wipers and no hood. George was born in 1873 at sea on board the "City Of Adelaide" as I described before. He was a wonderful and a devoted father. He and Venie went to America in 1899 for their honeymoon with John Bainton who went on business. He, George, and his brother Murray bought a property in the country at Wallenbean near Yass. This was not a success and the partnership was split up. Alan and I went there as children. In 1913 all business was getting difficult and George had a nervous break-down. To help him Venie and he went to England to see relations. On the way back the Great War I broke out and the ship "Beltana" had to sail blacked out round Cape Horn 1914. George's condition got worse on his return and all the business and shipping troubles were had during the war. George was in and out of hospital and felt himself too big a burden to the family so he committed suicide on July 15th, 1915. This left Mother (Venie) in a terrible state and we children were inconsolable as we all adored him as a wonderful father. At this stage Mother's brother Uncle Harvey and his son of 9-11 came to stay with us as he was divorced from his wife. She was a lovely red-haired young woman and fell in love with a friend of Uncle Harvey's and went off and married him. Not long after that Uncle Harvey committed suicide leaving Mother to have little Harvey. There was a family feud over little Harvey as his mother wanted him and Venie's relations thought that she should not rear him. Mother (Venie) fought for Harvey to go to his own mother which he did, and had a wonderful step-father. Mother had only one sister Elsie, younger than Venie. She was very fond of Vera (Pop) who was called Elsie after her. She nicknamed Vera her sweet "Poppy" and this has stuck for life. She came to Okinya to look after 5 of us 1914. While Mother and Dad went to England. She had finished her nursing at Royal Prince Alfred. As Mother and Dad sailed across the harbour in front of Okinya we all went onto the veranda and waved towels. Jean was in the kitchen and pulled the big wooden safe onto herself and had a big cut on her forehead. When Mother and Dad got home from England Auntie Elsie joined the British Nursing Service and went to England. She was first on the hospital ship "Panama" and received the first wounded men evacuated from Gallipoli. The ship was fitted for 300 men, but 600 came abroad and with shocking wounds. She met a bush-brother, Arthur White, returning from the war and he gave up his church vows of celibacy and married her and had a Parish in Melbourne. They had one son John who joined the army and fought in Korea.